We’ve found the best Batman, Superman, Wonder Woman, Teen Titans, Justice League, and other DC comics inspired baby clothes. With the huge increase in superhero films and TV shows, it’s no wonder there’s a large growing demand for comic-themed onesies. All these heroes are household names that are even loved by your own parents. 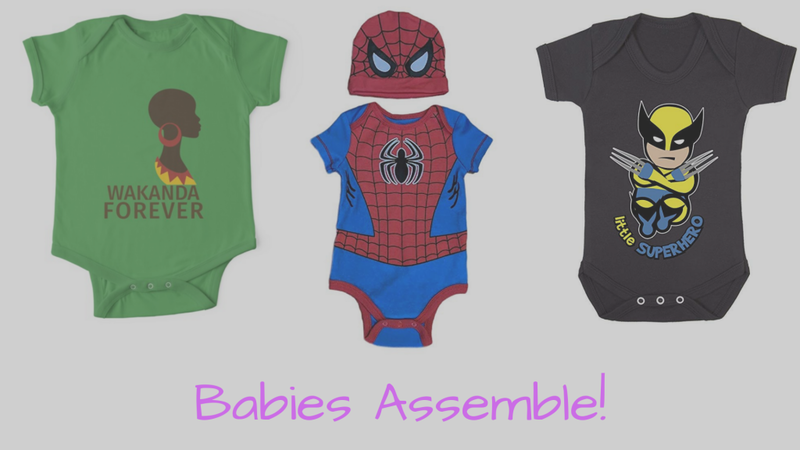 We know you are looking forward to introducing your little one to all these characters, but for now, you’re just going to have to settle for dressing them up like they have super powers. Kicking off this list is one of the most iconic heroines of all time, Wonder Woman. Props to DC for empowering women early on without all that rescue the princess nonsense. I’m a sucker for some classic baby clothing designs and this Batman logo reminds me of the original Tim Burton movies. Remember when Michael Keaton was Batman? Either way, there’s something to be said for a simple logo that everyone recognizes. It’s a bird, it’s a plane, nope it’s super baby! Your little one can take to the sky with this outfit that includes a onesie, cape, booties, and a hat. Perfect for family pictures, fighting crime, and filming a successful Warner Bros. movie. Zip, zoom, goodbye. That’s what it feels like once your child learns to roll or crawl. They become little miniature Flashes that have the ability to vanish in a blink of an eye. Which makes Flash a perfect outfit for your baby. This set comes with a onesie, hat, and booties. For those of you who love pink and want an alternate version of the classic Superman costume. This one doesn’t include a cape, but you can still have lots of fun flying your baby throughout the house. Just don’t drop them. I said, are you ready? Who lives in a pineapple under the sea? Oops, wrong underwater hero. This is Aquaman and he sleeps with the fishes. He also speaks to them. If Disney purchased DC, do you think they’d make a Little Mermaid crossover movie? The real master of the universe next to your baby. If only Green Lantern could take on Thanos in a one on one. Who would win? You would, because that movie would rock. I don’t think anyone imagined that Green Arrow would be the breakout DC television show. Unfortunately, your child will have to wait quite a few years to watch it with you, but you can get them a toy archery set in about 4-5 years. Before becoming Nightwing, Robin helped Batman keep Gotham safe. Your child will be able to assist you in a few years with washing dishes, cooking, and putting clothes away. Seriously, they might not be as efficient as you, but little kids do like to help. Nightwing is a great metaphor for your child growing up and becoming a strong independent adult. Sure, your offspring will make an awesome sidekick, but they got to leave the nest someday. I love this onesie, mostly because babies get these really serious looks on their faces for no reason. They just stare out in space like they’re pondering the whole universe in that very moment. Also, who doesn’t love Nolan’s Joker? This is the real Terminator. Yes, this is a Mega Man/Cyborg crossover, but Victor Stone is an amazing superhero. Who knows, maybe when your child is 100 years old they’ll have cool cybernetic replacements as well. For those of you that love Catwoman we have found the purrrr-fic onesie for you. Cats are kind of like babies in the sense they always seem to be letting their curiosity get them into trouble. Luckily, you keep your child’s nails clipped so they don’t shred the curtains and sheets. This romper comes in multiple colors. These are two onesies that you can buy together or separately. I personally love the Up All Knight romper simply due to the fact that babies tend to sleep in patterns, regardless of the actual time. It’s one of the more unique Batman-inspired designs we’ve seen for sale. Makes a good gift as well. This is great for when your baby is being naughty. You know those days when you’re frustrated, feeling the blues, and your baby just won’t cooperate. It’s okay, that’s normal. Raising kids is hard work. Dress your little one in this and pretend they just broke out of Gotham’s notorious asylum. I don’t know about you guys, but I really enjoy stories with Blue Beetle. I love the origin stories and the internal struggle of morality that is waged with the alien entity. Your baby has a couple of years left before they can think on that kind of level, but you are probably facing those tough internal decisions every day. Keep up the good fight. We try to feature lots of unique baby clothes here, but this Swamp Thing onesie is quite the rare find. It’s the box cover of the classic Nintendo game. We know that there are those of you that love the green superhero made of plants, so I hope you can give this onesie a good home. Do you remember the Teen Titans series? A superhero show with lovable characters and wholesome themes. It’s hard to believe that it aired almost 15 years ago. Who didn’t love Beast Boy? He might be one of the cutest DC characters of all time. Next to Beast Boy, Raven was easily the most popular of all the Teen Titans. Half demon, half goth her wit is unmatched throughout DC. This onesie is the perfect gift for those of you that are a little on the darkside. This Batman onesie would make even the Joker smile. It’s probably the cutest romper we feature on this page. It even comes with a cape. This romper symbolizes the foundation of building a great superhero team. Unfortunately, I can’t seem to find the blocks for sale anywhere, so I guess the best alternative is this onesie with building blocks. I’ll let you debate why certain Justice League members are not included here or why Batman is on top. If you’re simply looking for packs of cute onesies that you can dress your baby in, then we’ve got you covered. First up is this superheroine set featuring Batgirl, Batwoman, Supergirl, and Wonder Woman. If you live in a Batman house, then you’re in luck. This Gotham pack contains Batman, Robin, Joker, and a Riddler onesie. I’m a big fan of that Riddler romper. This whole set is worth it just for that. Finally, we have the Justice League pack with Superman, Flash, Aquaman, Green Lantern, and Batman. Unfortunately, they didn’t include Wonder Woman which is just a shame. Still, these onesies all come in a convenient pack for a good price. We featured a regular Wonder Woman logo onesie above, but this one is more of a costume. It comes with a hat, booties, and a cape. The perfect outfit for those parents that dream of their babies becoming superheroes. He’s kind of like a superhero version of Robinhood. The equivalent of Marvel’s Hawkeye. The nicer version of Batman. Green Arrow fights alongside some of the most popular Superheroes in the DC Universe. However, he doesn’t really have any super powers. I guess he really is just a nicer version of Batman. Originally the Arch Nemesis of the Teen Titans, Deathstroke has more recently been featured in the Green Arrow television series where he’s gathered a cult following. Luckily, if you’re a fan you can now show it off by dressing your baby in this romper. Comes in multiple colors. This onesie accomplishes two things. First, it’s a simple design and I know some of you out there are really into minimalism when it comes to art. Second, I know there are a bunch of Nightwing fans out there. We featured the logo romper, but I think this design does Nightwing a little more justice. For those of you that love a more modern Aquaman, like the one featured in the films, then this romper is probably up your alley. It’s simple, comes in multiple colors, and lets people know you’re a true fan. I wanted to feature a plain Superman logo onesie. Not a costume or cutesie design, just the classic emblem. Unfortunately, kryptonite to help your baby sleep is not included. Sometimes you just want a Batman costume outfit to dress your little one in. Great news, that’s exactly what you get with this one. Perfect for those parents that love everything Batman. Don’t worry that utility belt is not real. Finally, you can now dress up your baby as your number one sidekick. Now when you take them to the grocery store, the mall, or park everyone will know you two are a superheroic duo. Just don’t let the Joker get ahold of them. You can’t fight crime without wearing something on your feet. This goes for your little one as well. These action packed booties boost kicking, flying, and brain power. Actually, they are just super cute. These booties feature most of your favorite Justice League heroes and come in a multitude of different sizes. You’ll now be able to complete your baby’s DC comic outfit. They might not be able to talk or walk, but you’ll rest easy knowing that your child’s mere presence is keeping criminals at bay.